How often has the Caribbean been referred to as the home of “sun, sea and sand”? If a unit of electricity was available for every time such a reference was made, the Caribbean might well have more energy than could be generated by the whole output of OPEC. Ok; that’s an exaggeration. But the Caribbean does have vast amounts of renewable energy potential and it’s all around us – in the sun, in the sea and yes, (in a manner of speaking) in the sand. Pick any Caribbean island and calculate the amount of solar insolation it receives annually. The number will be thousands of times greater than its total electricity consumption. Ocean energy, in all its forms, is a constant and inexhaustible resource. So is geothermal energy; the basis of the rock from which many of these islands are formed. As if that weren’t enough, add the winds that sailors enjoy for two-thirds of any given year and the biomass resources available from agricultural by-products and all of this adds up to an enormous, renewable and sustainable energy resource for the Caribbean. Yet despite this, the Eastern Caribbean is almost entirely dependent on imported fossil fuel for electricity generation. Only two of the nine member countries of the Organisation of Eastern Caribbean States (OECS) have any renewables at all in their national electricity mix and renewable energy accounts for only three percent of total OECS installed power capacity. Why the huge difference between potential and actual? There are two basic reasons: one is technical, and the other is related to policy. This article argues that the OECS as a group can achieve, within 15 years, self-sustainability in electricity, using renewable energy technologies that are available now – but that success will ultimately depend mostly on our ability to get the policy matters right. First off, put a misconception to rest. Renewable energy technology is not experimental or impractical. It is real-world technology, being used in numerous applications worldwide, from the miniscule to the enormous. In fact, the largest power station on earth is a renewable energy plant – the 14,000 Megawatt (MW) Itaipu hydropower station that straddles the border of Brazil and Paraguay. Figure 1 indicates the massive scale of renewable energy potential. One percent of solar insolation alone has the potential to supply global energy demand 50 times over. 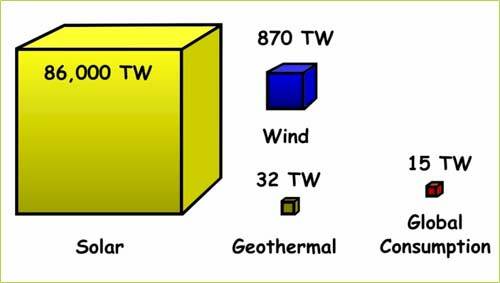 Available wind power is over 50 times greater than global demand, and geothermal potential is twice global demand. But the basic technical problem is that although renewable energy sources as a whole are widespread and abundant in nature, they are also relatively difficult and expensive to collect and convert, on a large scale and on a constant basis, into a directly usable form such as electricity. Solar electricity is the extreme example. Commercially available photovoltaic (PV) systems are in the region of 5 to 19% efficient – and to power the 20 MW electricity demand of mainland St Vincent would require installation of 40 acres of PV panels, at a capital cost of over US$100 million – and the installation would only produce power when the sun is shining! So despite its massive potential, PV is not yet ready for its large-scale moment – although emerging technologies and manufacturing methods promise to change that, with radical efficiency gains, flexibility in application and plummeting costs. In the meantime though, on a small scale, existing PV technology is entirely feasible. It is perhaps surprising to learn that the countries with the largest amounts of PV capacity installed are not-so-sunny Germany and Japan. Surely then, PV should be more widely used in the Caribbean? So far, the widely-used renewable energy technology in the region is hydroelectricity, which Dominica and St Vincent have installed. The up-front costs of these installations were significantly higher than the costs would have been for the equivalent amount of diesel power. But the point about renewable energy is that once the capital has been expended to build the plant, the fuel cost is practically zero, while that of a diesel plant can account for up to two thirds of the total operating cost – so the economics work out in favour of the renewable energy investment over the lifetime of the plant. Add to this the fact that sky-high and increasing oil prices will fuel increasing R&D into renewable technologies, thus driving capital costs down and conversion efficiencies up even further, and we see that technology and economics are not the barriers to the present and future use of renewable energy in the Caribbean. Interconnection of some of the OECS power grids. The critical condition is the first, and to find the source that can satisfy it, look to the sand. The black sands found on some of our islands give away their volcanic heritage – and indicate the potential for the widespread use of geothermal energy (literally, heat from the earth) to produce a large, constant and renewable baseload electricity supply to the region. A geothermal energy project now being implemented on Nevis is at the vanguard of this idea. The Nevis project is reported to have proven the feasibility of installation, at a single geothermal site, of a 34 MegaWatt (MW) geothermal plant, construction of which is scheduled to commence by October 2008. If this capacity is implemented, it will be sufficient to supply all of Nevis – and St Kitts, via submarine transmission cable – with baseload power. The project developer is now investigating two other sites to determine the total geothermal resource on Nevis, which at this point the developer estimates to be in the region of 200 – 500 MW. Then consider that agreements for geothermal investigations have recently been announced by two other OECS countries, and that the aggregate peak demand for electricity in the OECS countries is now about 250 MW, and we see that the available geothermal resource in the OECS could outnumber today’s power demand by several times. Implement energy efficiency and demand-side management programs to reduce overall national energy consumption per unit of output. Governments in the region have already progressed on the last of these items, with the implementation of the admirable Cuban-sponsored program for the replacement of incandescent bulbs with energy-efficient bulbs. The first two listed conditions for achieving the overall goal of OECS electricity self-sufficiency are necessary, but not sufficient. Because some of the OECS islands will not have geothermal potential, interconnection of some of the power grids will be required between the geothermal haves and the have-nots. At first glance, a system comprising an interconnected northern OECS grid, a southern OECS grid and Dominica separate in the middle, could be one possible configuration. Though it will be a large and costly undertaking, the main barriers to establishing such a grid are not technical. Undersea high-voltage power transmission is a well-established practice; such grids exist in various parts of the world (the first in the region was the 23-mile link commissioned in 1966 between Trinidad and Tobago) and more are being planned – some specifically to transmit wind power from remote or offshore locations to load centers. An OECS interconnection project will be more ambitious than most and will have its fair share of specific challenges (such as deep waters in some areas and the relatively large number of interconnected countries). But the technical problems can be solved, given the right set of conditions – and these conditions are mostly in the realm of policy.